The distinction between Outlaw and Outsider poetry is often confused, but nowhere is the difference more clearly delineated than in Thomas L. Vaultonburg's book Submerged Structure, which is a veritable poetic memoir of his struggle with Schizoid Personality Disorder. An easy rule for differentiating between Outlaw and Outsider poetry (and art) is the Outlaw is aware of the rules, but is intentionally breaking them either because he does not agree with them, or simply because he has a disregard for the prevailing order, but the Outsider is unintentionally unconventional, breaking rules more from lack of knowing the rules or even a mental illness or learning disability that prevents them from behaving in a way consistent with societal norms. 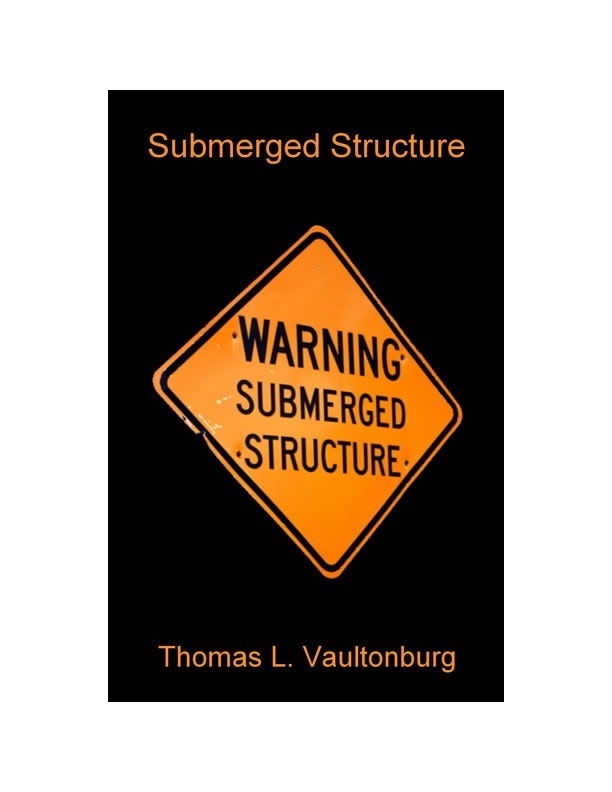 Such is the case with Thomas L. Vaultonburg and his latest book of poetry Submerged Structure. Whereas the Outlaw is flouting the rule of law, convention, or form with purpose and intent, the Outsider is incapable due to organic limitations from coloring within the lines. 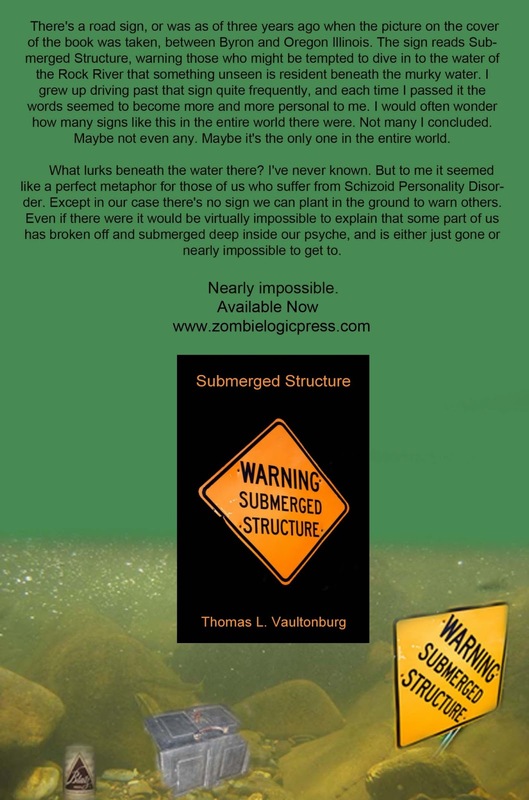 Vaultonburg was diagnosed with the rare condition Schizoid Personality Disorder as a teenager, and has spent his entire adult life trying to find ways to assimilate himself into society by mimicking human behavior and (as he describes it) "making himself invisible" in social situations. The result is a poet who observes human behavior, interactions, customs, and relationships as an outsider, unable to participate in an organic and socially acceptable way, but yet fascinated to learn the rules of his own species. Schizoid Personality Disorder blunts the mechanism that makes one feel emotion and also makes one resistant to praise or criticism, positive or negative reinforcement, or pressure to conform. The intellect is left completely in tact, so the sufferer is completely aware that they are lacking a major component of their humanity, and sense the discomfort this causes in others, but is unable to make the adjustment necessary to assuage that discomfort in others. An analogy from pop culture would be Commander Date from Star Trek: The Next Generation, and android who is self-aware and sentient, and desires to emulate human behavior, but can only do so in an imitative manner, not organically. The victim of Schizoid Personality Disorder (and I say victim because to have a huge portion of your humanity absent is a great disability) can learn to imitate human behavior with careful observation and practice, but cannot simply "be human." I recall occasions early in adolescence when I would practice simple human behaviors such as walking, shaking hands, smiling, or making eye contact. Imagine your life if behaviors this simple and essential to social hygiene were foreign to you. Other Outsider artists could be suffering from schizophrenia, blindness, or an illness which literally makes their perspective and mode of epistemology at variance with the normal population. They may not be trying to be deliberately strange, they may simply be relating the Universe the way it looks to them, whereas the Outlaw sees reality the same way everyone else does, but wants to be at odds with it as a means of protest or mode of self-gratification in feeling "different" or "unique." At fourteen I may have been obsessed with passing as human, but at 44 there are so many more important things to try and be. If it makes you uncomfortable that I am unable to hold your gaze, shake your hand, pretend to be interested in your dog, or hold my carriage in the obsessively conformist method you do but are unaware of how conformist and absolutely rote you are, I couldn't give less of a damn right now. I had designed this for the back cover of Submerged Structure, but when it was time to go to press it was just too much added expense and trouble. I still like it. Recently I've begin trying to own the distinction of Outsider poet. For many years I worked in service and behaved badly and fancied myself an Outlaw, but it wasn't the case. The poems in Submerged Structure began during a summer when I was out of work and I sat on a porch and just started to write with no concept or purpose in mind. I just looked around me and started to write about how weird human behavior seems to me, and how unusual I know my perspective is. I'd never really disliked people or been bitter that I wasn't one of them. One of the great ironies in observing human behavior is how obsessed you are, and what great pride you take in feeling unique or original, and how utterly not you are. I don't levy that as an insult, it's just an observation. Here we are on day 14 of National Poetry Month, and I realize it's been months since I talked about any of my books. This is the latest one, Submerged Structure.